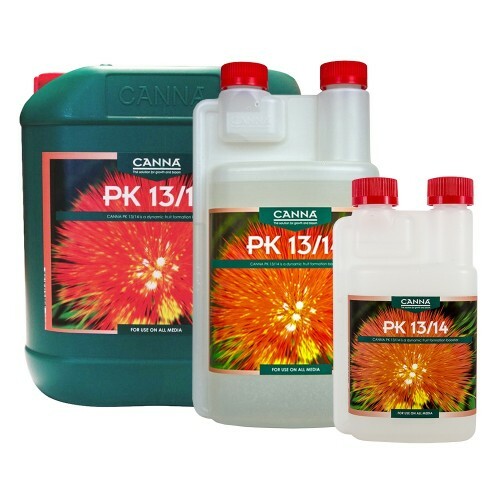 Canna PK 13/14 is a superb blend of potassium and phosphorus, as both of these elements are crucial in the flowering cycle of plant growth and development. PK 13/14 allows plants to absorb these nutrients rapidly for optimal growth. Phosphorus is necessary for both energy transfer and a healthy metabolism in the flowing phase of development. It helps strengthen cells during flower formation. Potassium is critical for transporting nutrients and water. It also helps control sugar production, thus increasing the sweetness of the fruit. It helps to ensure that the crop has enough sugar during the flowering cycle, which is necessary for flower growth and of course for taste. It is best to use Canna PK 13/14 three weeks prior to harvest. Dissolve 1.5 ml concentrate per 1 liter of water and add to the full nutrition tank. Add Canna PK 13/14 for 3-6 days. It will be easily absorbed and dissolves quickly. PK 13/14 can be used in conjunction with Canna Boost Accelerator, However, never mix the 2 additives at the same time. Wait 15 minutes between applications and never mix any products in their concentrated form, as this can cause adverse chemical reactions. (unless otherwise specified) Make sure to follow all directions on the packaging.